Ikea, Marimekko, mid century modern…the northern countries seem to have a lock on what’s cool and awesome. Their books are great, their music is cool and eerie, their cars are efficient and well-designed. Even their food is good. Gravlax, those meatballs that are part of the reason to go to Ikea. Hell, I’m even a fan of Aquavit, a Swedish vodka that tastes like liquid rye bread and Noma is considered the best restaurant in the world. But I’ve found one thing they don’t do well. 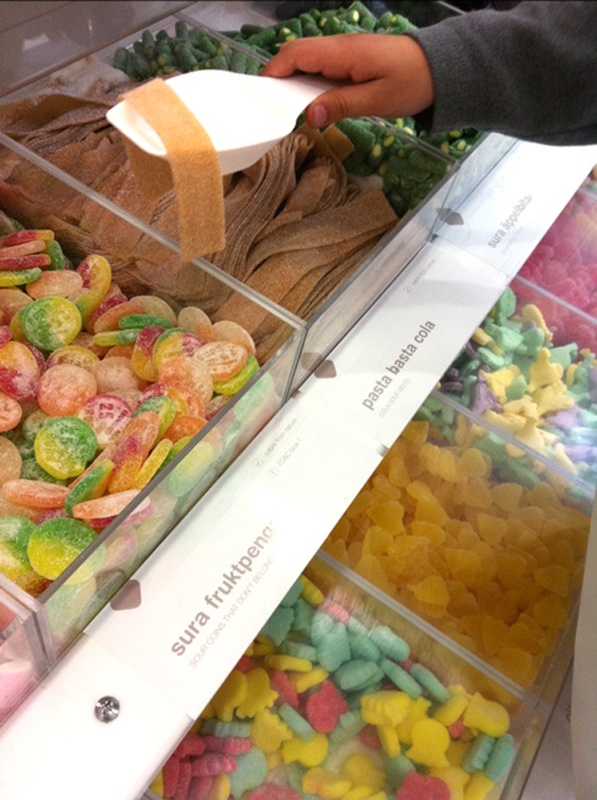 Last week, Nice and PU and I stopped into a new Swedish candy store. It was clean and white and the candy was inviting. We filled up two bags and found a stoop nearby, eager to dig into our goodies. Ummm…Yuck. Bleech. Gross. Salty, fishy, chewy in that weird way that old candy gets, not quite satisfyingly sweet enough for our American palates, PU summed it up this way: they said it’s good for us. I guess they meant it doesn’t taste very good. It’s good to know that even the Scandinavians have their Achilles heel.